I am so heartbroken about Melinda’s passing. I have tried so hard to get her more help especially recently. I loved talking to her on the phone and on Facebook. She has been a big part of my life in the last decade. This broken system has failed her and her little boy and family and I am so mad. This should never happen this day in age. Thank you Mary O for the boards , this is where I have met lifelong true friends. May her beautiful soul rest in peace without the pain and suffering of Cushings. I do? Her niece said it was yesterday. Wasn’t that the 10th? Im so sorry to hear of her passing. I didnt know her but to me when we all have such difficult things in common it links us together. My heart and deepest sympathy goes out to her family and friends. I’m sorry to hear of her passing. Thoughts and prayers with her son and family. 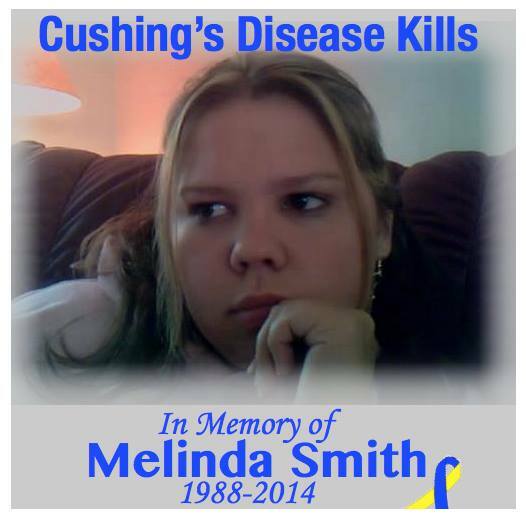 Lost my sister in April 21, 2008 after years of struggling with this disease. Mindy is my niece and I can’t tell all of you enough how much Mindy enjoyed the camponionship you guys gave her one here. Mindy was and amazing girl and always will be. She has a son that is the spitting image of her, I see it more and more in him each day. Mindy would be turning 26 the day after Christmas. I love you Melinda Carol!! That’s so sad. I’m so sorry that she had to go through this, and I now realize more than ever that I’m so lucky to have recovered as well as I did. I now thank God more than ever. I’ll pray for her to have a good afterlife.